A new series of dramatic programs based on authentic case histories demonstrating how the lie detector machine provided "The Hidden Truth" will make their debut under that title over WMBO and WMBO-FM today in the 8 to 8:80 p. m., EDT, time period. The programs will be adapted by writer-director Jack La Frandre from the actual case files of the late Leonarde Keeler, perfector of the "lie detector," inventor of the "Keeler Polygraph," and one of the country's foremost scientific criminologists. Mr. Keeler's lie detecting machine was responsible for cracking the famous "Majczek Case," which freed an innocent man from a long prison term. It was on this story that the film "Call Northside 777" was based. Research work on this series of programs will be done by Eloise Keeler, sister of the criminologist. Donald Gallagher, noted Chicago character actor, will portray Mr. Keeler in the series. For the first program next Wednesday "The Hidden Truth" will present a drama demonstrating use of the lie detector in forcing well-to-do contractor to confess to the "double indemnity". You probably remember a summer mystery series, "The Hidden Truth," which KFAR carried earlier this year. Highlight of the show was the use of the famous Keeler lie detector machine in bringing criminals to justice. Fairbanks listeners will get some inside data on this machine Monday night at 6:15 when Capt. Jack Harrison, distinguished Chicago criminologist, and president of the lie detector company, Leonarde Keeler, Inc., will be heard on KFAR. Capt. Harrison, in Fairbanks as the first guest speaker for the Fairbanks Dinner Club, is a former associate of Dr. Keeler and is now owner of the controlling corporation stock. 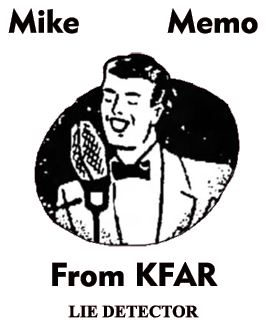 Remember that time--following the 6 p.m. newscast Monday night on KFAR. Can You Top This, with gag stories as its theme and with a panel of experts trying to out-tell listener offerings, has gone off MBS after a network career dating back to before the war. Starting next Wednesday night it will be replaced by "The Hidden Truth," a mystery. 7 p.m.--The Hidden Truth (WKOW): new series based on cases from files of Leonarde Keeler, inventor of the lie detector. The Hidden Truth, KMAC, 7 p.m.--First in new series based on case histories of Leonarde Kellier, perfector of the lie detector. NEW YORK, May 24.In prospect for tonight; MBS 7:00 "The Hidden Truth," new lie detector drama replacing Can You Top This. A new mystery turns up in the KALL lineup today, a tasty number titled "Hidden Truth," being skedded at 5 p.m. H-T is neatly sandwiched betwixt the 4:30 Nick Carter opus and a 5:30 visitation by "The Saint." 7 p.m.--The Hidden Truth (WKOW): lie detector uncovers truth about missing welfare funds. A couple of programs new to the Wednesday list present themselves tonight--one via Mutual and WEBR, the other over on CBS and WGR. First mentioned is The Hidden Truth, coming at 8 o'clock. This is something of a "whodunit" dramatizing case histories from the files of hte late criminologist Leonarde Keeler, showing how the lie-detector, which he developed, has helped in tracking down criminals. Tonight's episode deals with a minister cleared of suspicion when funds placed in his care are missing. The lie detector gets the guilty party. 7 p.m.--Hidden Truth (WKOW): police department "delinquency" bared as something more serious. 7 p.m.--Hidden Truth (WKOW): $80,000 worth of paintings disappears. 7 p.m.--The Hidden Truth (WKOW): fisherman's hook finds evidence in 15-year-old case. 7 p.m.--Hidden Truth (WKOW): lie detector proves innocence of youth convicted of murder. 7 p.m.--Hidden Truth (WKOW): lie detector confirms a mother's faith. AIR BUBBLES--The Hidden Truth, squeezed off the air last week in favor of a Korean war news round-up, returns to Mutual and WEBR tonight at 8 o'clock with an episode showing how the lie detector enabled a mother to clear her son of a murder charge. 7 p.m.--Hidden Truth (WKOW): lie detector solves mystery of missing safe deposit box. WEBR is canceling The Hidden Truth tonight at 8 o'clock in favor of a downtown theater opening--with lobby interviews, etc. 8:00 "The Hidden Truth," Donald Gallagher; WOR. 7 p.m.--Hidden Truth (WGN): lie detector finds motive for boy's arson. Knocked off the air for two weeks in succession through the vagaries of Summer radio programming, The Hidden Truth will be back in place tonight at 8 o'clock over Mutual and WEBR. The dramatization, same as was originally scheduled for last Wednesday, deals with a 16-year-old boy found guilty of arson. It also shows how the lie detector probed into the workings of his mind to discover the motive behind the crime. The jury found the 16-year-old boy guilty of arson. But it remained for the lie detector perfected by the late criminologist, Leonard Keeler, to probe into the workings of his mind for the motive, which will be outlined during Mutual's "The Hidden Truth" broadcast at 7 tonight on WCLO-WCLO-FM. 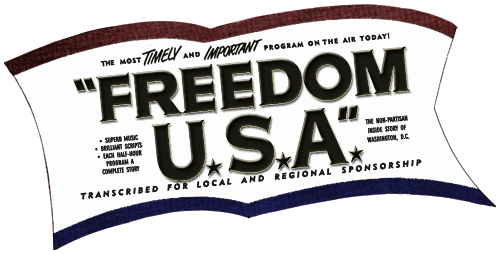 This story was originally scheduled for July 19, but was postponed for a special broadcast from Washington, relative to President Truman's essage of that date to congress. 7 p.m.--Hidden Truth (WGN): lie detector studies arsonist's mind. 7 p.m.--Hidden Truth (WGN): lie detector nips extortion plot, saves thousands of lives. 7 p.m.--Hidden Truth (WGN): woman disappears on eve of son's return from overseas trip. The Los Angeles bureau of missings persons sets the scene for The Hidden Truth broadcast on WGN at 8 o'clock tonight. The authentic case based on lie detector files is the story of Mrs. Henrietta Hall, who disappeared from her Burbank, Cal. home. 50-8-16 Janesville Daily Gazette - Woman Vanishes Strangely and Backgrounds MBS Drama By JOE URBAN The strange story of the disappearance of a woman from her Burbank, Calif., home two weeks before her son's return from duty in occupied Korea will be revealed during Mutual's "The Hidden Truth" at tonight on WCLO-WCLO-FM. When the late Leonarde Keeler and his lie detector were called to unravel the mystery, the instrument's sensitive needle and the criminologist's probing qustions reveal an unexpected human tragedy. The case, which made headlines on the west coast, is taken from the files of Keeler, the perfector of the lie detector machine. This program takes its weekly dramas from authentic case histories of headline news stories solved by the lie detector machine. 7 p.m.--Hidden Truth (WGN): story of girl who could "hear" only through her wrist. 7 p.m.--Hidden Truth (WGN): The lie detector clears a young man charged with a serious bank robbery by a lady teller. AIR BUBBLES--The Hidden Truth presents an actual case wherein the lie-detector proved a young man innocent of the bank robbery of which he was accused. The lady teller of a small town bank accused a respectable young man of a serious bank robbery. The young man claimed he was innocent but it remained for the lie detector to point the finger of suspicion at the real culprit during Mutual's "The Hidden Truth" on WCLO-WCLO-FM at 7 tonight. The story, which made headlines several years ago, is taken from the files of hte late Leonarde Keeler, perfector of the Polygraph, the lie detector machine. The original lie detector, perfected by Keeler, is one of the display attractions at the Chicago Fair. The case histories in which the machine was used background hte entire "Hidden Truth" series. 7 p.m.--Hidden Truth (WGN): the dramatization of one of the most bizarre murder cases on record in the "tri-cities" of Davenport, Ia., and Moline and Rock Island, Ill.
7 p.m.--Hidden Truth (WGN): lie detector helps solve case of "house of doom." 8:00--The Hidden Truth, "House of Doom," WOR. AIR BUBBLES--All the scary stories aren't on TV tonight--Mutual network's The Hidden Truth, coming over WEBR at 8 o'clock, presents a true case of city-wide corruption and shows how the lie-detector was used to prevent release of a criminal by political pressure. Don Gallagher portrays the late Leonarde Keeler on the Hidden Truth drama over WGN-MBS at 8 o'clock tonight. The program, presented in co-operation with the 38th national safety congress and exposition in Chicago demonstrates the role of the automobile in taking the lives of innocent victims and the use of the lie detector in driver's aptitude tests. AIR BUBBLES--Count of Monte Cristo and The Hidden Truth come over standard radio tonight between 9 and 10 o'clock via WEBR; the latter has an actual case wherein a beauteous mother was accused of bludgeoning her baby to death--and shows how the lie-detector determined the vague emotional line between sanity and insanity to clear up the case. The role of the lie detector in trapping the murderer of two Gary, Ind., women will be dramatized over WGN-MBS tonight at 8 o'clock. The files of the late criminologist Leonarde Keeler reveal the actual case history of tonight's story. Story reveals the role played by the lie detector in probing the mind of a woman held captive in blackmail. The role of the late criminologist is portrayed by Don Gallagher. 8 p.m.--Hidden Truth (WGN): Dickens' "Christmas at Dingley Dell." 51-02-02 Buffalo Courier-Express - How the lie detector was employed to screen displaced persons entering the United States during the last war will be revealed during a delayed broadcast of Mutual network's The Hidden Truth tonight over WEBR at 9 o'clock. In checking hte backgrounds of these persons and their usefulness to the nation, the lie detector uncovered many foreign agents slipping in as DPs. The program will dramatize the case of a displaced woman who, under hte scrutiny of hte lie detector, was found to have motives other than her "love for freedom" in desiring to enter this country. Material for The Hidden Truth is gathered from the files of the late Leonarde Keeler, perfector of the lie detector machine. 8 p.m.--Hidden Truth (WGN): story of Chicago's St. Valentine's Day Massacre. At 9 O'clock, The Hidden Truth has an episode based on the famous St. Valentine's Day mass murder in Chicago back in 1929 when seven men engaged in gangland activities during the prohibition era were lined up against a garage wall and mowed down to machinegun fire. The program will show how that crime led to new advances in scientific criminology, embodied in use of the lie detector. 8 p.m.--Hidden Truth (WGN): comedy marks story of young artist accused of abducting model. 8 p.m.--Hidden Truth (WGN): lie detector solves murder of escaped lunatic's wife. 8 p.m.--Hidden Truth (WGN): lie detector helps in "missing persons" case. 7 p.m.--Hidden Truth (WGN): lie detector solves double tragedy in farm home. 7 p.m.--Hidden Truth (WGN): lie detector reveals prisoner's deal with police. 7 p.m.--Hidden Truth (WGN): lie detector traps dope-using killer. MBS--8, Hidden Truth, "A Case in Love." MBS--8 Hidden Truth "A Case in Love." 7:30 p.m.--Hidden Truth (WGN): a modern Enoch Arden. 7:30 p.m.--Hidden Truth (WGN): artist and model try to use lie detector in phony publicity stunt. Hidden Truth How an artist and his attractive model attempted to use the lie detector to further a publicity stunt is to be revealed during the Hidden Truth broadcast tonight at 9:30 p.m. The dramatization is based on an actual case history from the files of the late Leonarde Keeler, the perfector of the lie detector machine. Donald Gallagher stars in the role of the criminologist. 51-10-22 Wisconsin State Journal - 8:30 p.m.--The Hidden Truth (WGN): on new schedule. 8 p.m.--Hidden Truth (WGN): lie detector foils scheming wife. 8 p.m.--Hidden Truth (WGN): lie detector nabs robber and murderer. 8 p.m.--Hidden Truth (WGN): professor accused of being terrorist. 11 p.m.--Hidden Truth (WISC): lie detector uncovers guilty knowledge of "accidental" death. 11 p.m.--Hidden Truth (WISC): convict tries to beat lie detector. 11 p.m.--Hidden Truth (WISC): lie detector helps solve murder of beautiful redhead. 6 p.m.--Hidden Truth (WGN): unusual yuletide story about grave digger, goblins, small boy and lie detector. 6 p.m.--Hidden Truth (WGN): documentary drama, police nab killer of young bride.